san jose baby photographer • growing | gooseandbugsphotography newborn baby and child PhotographyCustom children's photography, specializing in newborn portraiture, on location in San Jose, Ca and the surrounding Bay Area. Remember this little guy, well he is growing like a weed! I couldn’t believe how much he has stretched out his I saw him all brand new 3 months ago. He was so sweet and sleepy the day we met up. These top 3 frames are all within seconds of each other, he really needed a little power nap and then seemed so content when we let him snuggle up and sleep. Posing a sleeping 3 month old isn’t always this easy. And finally with the family dog. She wasn’t too sure that first time I was there when he was a newborn but here she is gentle as can be with her baby. I think they are going to be really good friends. Oh, Leandra – these are beautiful. I love that you got him sleeping with the dog – and I love the first two you showed. Beautiful work! So, so cute! 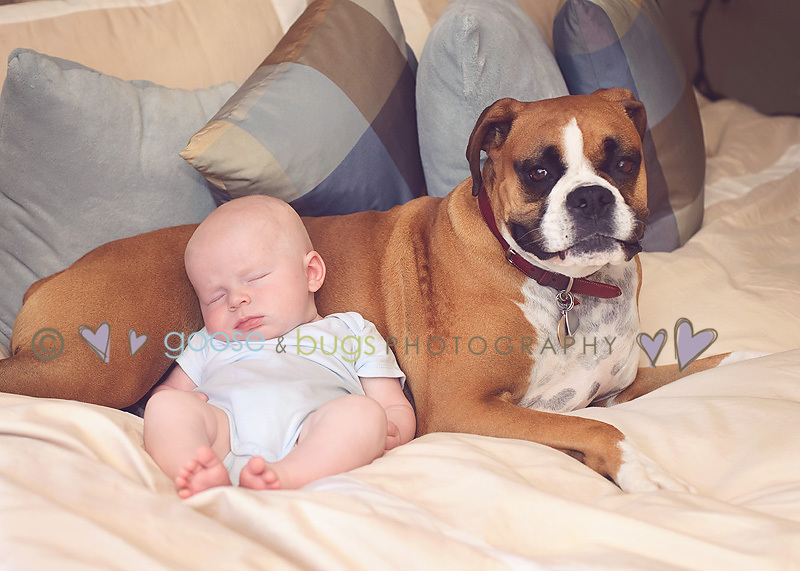 The sweet face in the awake pictures…the sleeping on the dog one…adorable! Oh my goodness! I love that last one. How adorable! I like hat and diaper cover ones. These are fantastic!!! The doggie shot is amazing. oh, the falling asleep ones made me giggle and the last one just makes me want to reach out and pat that puppy’s head for being such a sweetheart! gorgeous, leandra!